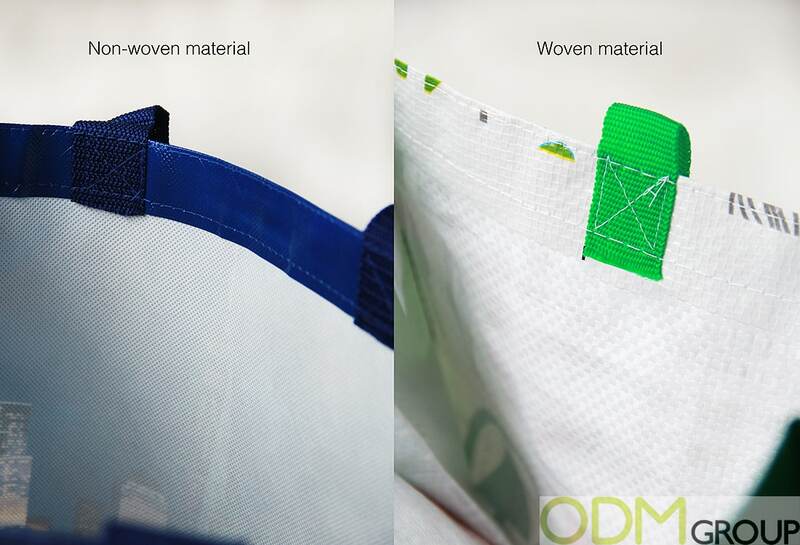 Woven vs Non-Woven Bags – What is the Difference? One of the most frequent questions we get asked by our clients is: what is the main difference between woven vs. non-woven promotional bags? Our blog explains technical and design features to help you design and manufacture unique branded products. Now that we have launched our new website for Patented Reflective Bags it is important to understand not only the benefits of reflective piping but also the raw materials involved. This case study looks at woven vs non-woven bags and the main differences between the two. 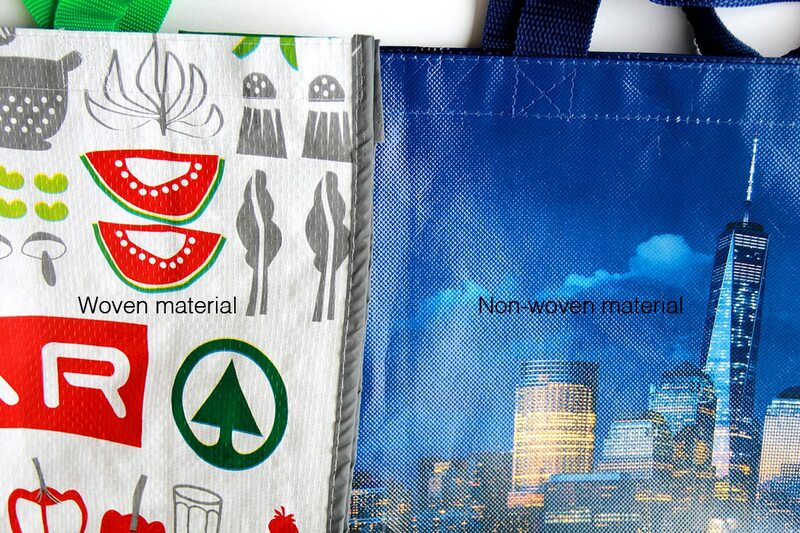 Both materials make great imprinted tote bags, but they are distinctly different. Each type has unique benefits and characteristics. Woven vs Non-Woven Bags – What is a Woven tote bag? Woven bags are made from fabric that has been woven to give the fabric strength. The process of weaving involves joining individual threads together to make a single piece of material. Doing this over and over again creates one large piece of cloth. The cloth is then used to manufacture tote bags in a number of different styles and shapes. It is able to retain its shape well. Woven fabrics are strong, therefore, bags can be reused multiple times. Can be designed in a laminated or matte finish. Non-laminated woven bags are not recommended as they will have a cheap look. Using reflective print or piping is a great option for promotional shopping bags. Woven vs Non-Woven Bags – What is a Non-Woven tote bag? Non-woven bags are are manufactured using any other material that is not woven. The product can be produced mechanically, chemically or thermally. Non-woven fabric is also made from fibers. However, the fibers are entangled together through whatever process is applied to them, as opposed to being woven together. Non-woven fabrics can be more versatile then woven bags. They are also used in a wider range of applications. Non-woven fabrics are commonly used in arts and crafts because they offer many of the same advantages of woven cloth but are less expensive. As many countries and organizations begin to ditch plastic bags non-woven bags are becoming popular replacements. Non-woven bags allow more printing and customization options. 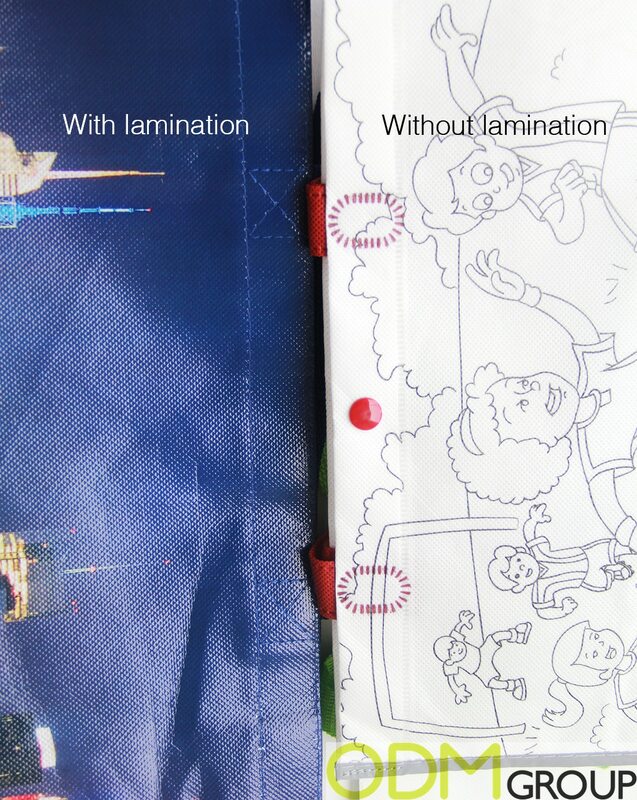 Non-woven can be made with or without lamination. This means designs can then be silk screen printed onto the bags. There is no doubt that the majority of our clients that we work with prefer non-woven bags. Although not as strong as woven fabric bags. Non-woven bags vs plastic bags: Non-woven bags are still more durable than the standard plastic shopping bag. Furthermore, non-woven bags tend to be cheaper then woven cloth, making them more affordable for marketing managers. We have worked with many clients to produce tote bags. ODM have extensive manufacturing contacts throughout Asia and can produce practically any size or design of tote bags. Get in touch today and talk to us about your custom designed tote bag. Ideal for gift with purchase promotions. We recently worked with a number of clients to supply them with Patented Reflective Bags. Patented reflective piping on the bags increases the visibility of the user at night. This safe and practical product is perfect for retailers to replace traditional plastic bags, whilst promoting personal safety. Check out these amazingly unique custom bag ideas. We also did a blog on PVC vs EVA, check it out here! Canvas tote bags have a natural, sustainable look about them. These fun promotional bags increase brand image. Which design would work best for you?